Old Navy is one of my favorite stores. I shop there often. There is always something in the store that can suit the needs of at least one member in my family. The prices are affordable, the styles are versatile, and there are several locations I can choose from. What can I say? Old Navy just does it for me. I'm sure you've heard about the OldNavyWeekly.com site. If you haven't, you've just been warned. Each week, this site is updated to include valuable coupons that are hidden in various places on the page. It is your job to uncover the savings. There are plenty of coupons to go around, you just have to visit early and often. I spent a total of $56 after the coupon. I thought I did a great job finding bargains. I never miss when I go to Old Navy. Tell me, do you find the best bargains when you go shopping? Do you use store coupons to save a lot of money? Thanks you so much for the information. I really am in love with Old Navy. They always have something. I am heading over to your site to see if I can try my luck again. Thank you so much! I appreciate that as I'm hoping if I can get a big enough response, they'll let me have more of these giveaways although I want one of the coupons! 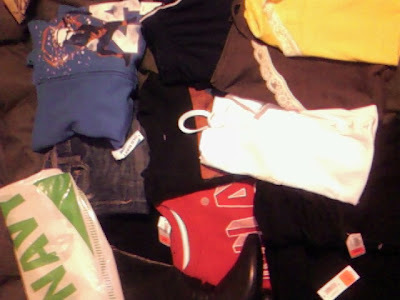 :( $50 in free clothes...can't beat that! I never win on the site.